Not sure what could be the source of the problem here. I have heard that there are issues with TextMate bundles not working well with Snow Leopard's ruby 1.8.7 install but it works fine on my machine. Even so, if you have a version of ruby 1.8.6 on your machine you might want to try setting the TM_RUBY environment variable (in TextMate preferences, under advanced, shell variables) to point to your 1.8.6 install. Beyond that there isn't much I can offer because I can't replicate your behaviour here. Obviously, if you find the source of the problem do let me know and I'll merge any patch that solves it. Mac's build-in Ruby 1.8.7 is 3-way universal binary (x86_64, i386, ppc), so it works. I'm having the same issue. I've tried both Snow Leopard's 1.8.7 and MacPort's 1.8.6-p368, neither work. 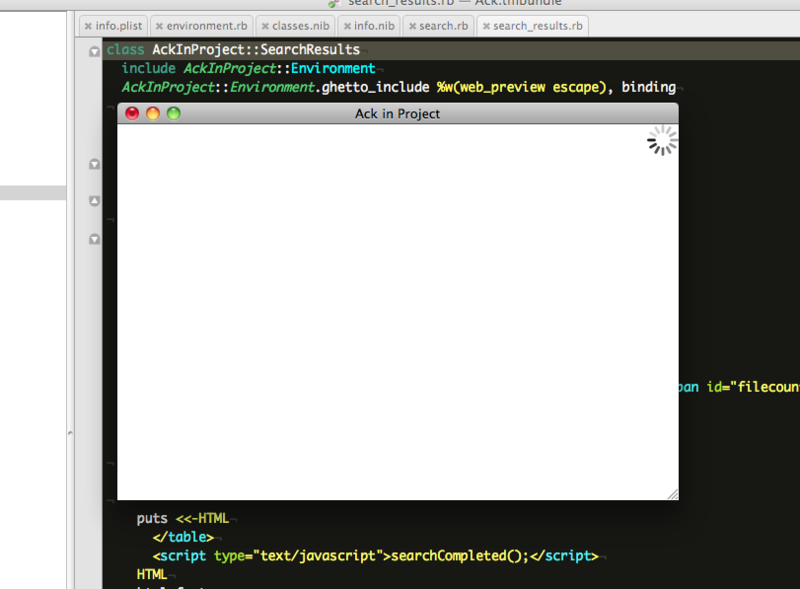 When I hit cmd-shift-A, the Ack In Project window comes up blank with a spinner, and stays that way. Found the problem. It was hanging in environment.rb:27, when requiring Support/lib/ui.rb. Specifically, in ui.rb, it is hanging when trying to require osx/plist. I've tried recompiling plist.bundle, but no luck. Interestingly, the test.rb file in the plist source folder hangs if I run under MacPort ruby 1.8.6-p368, but runs fine under Snow Leopard's 1.8.7. Yet, setting TextMate's TM_RUBY to 1.8.7 doesn't fix the issue for me. Then I noticed that Ack In Project uses "#!/usr/bin/env ruby" (as do all other ruby bundles), which for me would be running 1.8.6. I changed that to #!/usr/bin/ruby (1.8.7), and it now works. I encountered the same problem. Reverting to a previous version of the bundle made it work again (git checkout 50cda12). I do not have the TM_RUBY variable set. Ditto on the bundle working well with the system default ruby (1.8.7), but not with either 1.8.6 Ruby Enterprise Edition or the latest 1.8.6 version. For those of us using rvm, this can lead to some strange behavior when you forget which ruby version you're using. Like Brad, I changed the bundle to use /usr/bin/ruby and all is well again. It's working fine for me on SL. The bundle works for me on Snow Leopard with the #!/usr/bin/ruby change as well (I'm also using rvm to manage ruby versions, and that defaults to 1.9.1). Also, I needed to use the ack-standalone, as my own ack (TM_ACK set to /opt/local/bin/ack) did not work. For those still having trouble, remember to reload the bundle (Bundles -> Bundle Editor -> Reload Bundles) or flush cache and reload (hold down Option when reloading bundles).